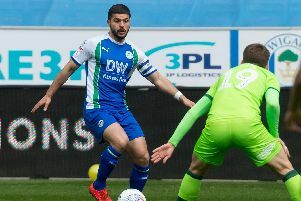 Daniel Farke hailed Wigan Athletic's backs-to-the-wall character that more than matched his table-topping Norwich City side at the DW. Norwich required a late leveller from Teemu Pukki to rescue a point, after Reece James had put Latics ahead just before half-time. Leon Clarke almost gave Latics all three points, only to see a stoppage-time header chalked off for a hugely-contentious offside decision. The big striker also came close to putting Latics two up at the start of the second period, leaving Farke to reflect on a 'very good point'. He said: "It was a complicated game, and we were perhaps prevented from creating as many chances as normal by a good performance from Wigan. "They had a pretty aggressive attitude, they fought with a knife between their teeth as they fight against relegation. "They have some high-quality players, especially on the counter attack, and I thought Leon Clarke was brilliant today. "He is of course an experienced player, he knows how to score goals, and he showed his quality. “Wigan are really a threat at home, they just lost four games here, and they are really difficult to play - especially when they are in the lead. Farke wasn't happy with the nature of Wigan's goal, with referee James Linington pointing to the spot after Sam Morsy's shot hit the arm of Ben Godfrey via a deflection off his leg. “My feeling is at the moment it’s a difficult period for us in terms of referee decisions," the City boss added. "But I won’t complain too much because we can’t influence it and we have to handle it. "My lads handled it in a really good way because in the second half we put so much pressure on them and took so much risk. “We changed our base formation and brought all our offensive players in and were able then to equalise and in the end I think we were pretty close also to winning the game.